I gotta be me! How could I resist the power packed old school nastiness of this blown small block Chevy riding in an authentic nostalgia dragster? Why would I want to? I talked to Dennis Overholser from Painless Performance wiring about his new ride. It’s almost ready to run the full Comp Cams roller equipped Dart block at a “Drag strip near you!” Dennis can’t terrorize an existing Nostalgia Drag Racing class because of the electronic fuel injection he used but he’ll still be able to tear up the quarter mile! Did I sense a little hesitation to drop the hammer Dennis? Prove me wrong! 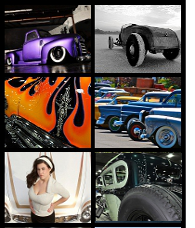 Dennis already has the Truckster featured here from 2009 SEMA Coverage, so check it out! I must have missed a favorite engine from SEMA 2010. If it did, let me know about it and send over some pictures!